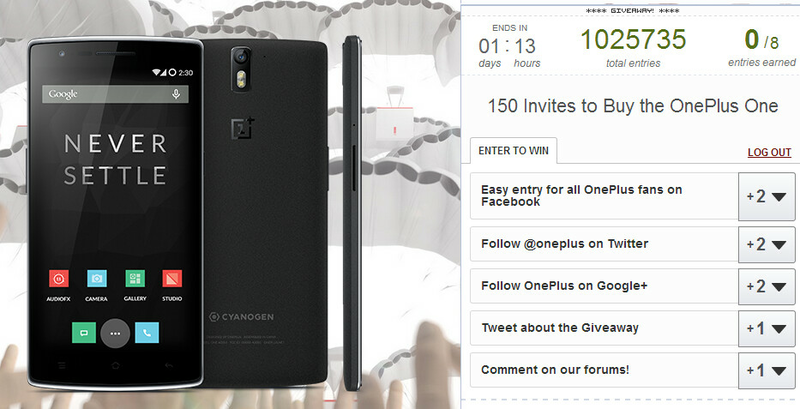 If you want a new OnePlus One smartphone, but don’t know how to get an invite to buy it, you can now win one. In fact, OnePlus is giving away no less than 150 invites to purchase the 64GB version of its handset (which costs $349, unlocked). Unfortunately, not everyone can enter to win. The contest is open only to applicants of at least 18 years of age from these countries: Austria, Belgium, Canada, Denmark, Finland, France, Germany, Hong Kong, Italy, Netherlands, Portugal, Spain, Sweden, Taiwan, United Kingdom, and the U.S. To enter the contest, you need to log in with your email (or with Facebook) at the source link below - you have time until tomorrow, May 22. At the moment, there are more than 1 million (!) entries. Officially announced on April 23, the OnePlus One runs CyanogenMod 11S (based on Android KitKat), and offers high-end features that you rarely find for less than $350, including: a 5.5-inch 1080p IPS display, 13MP rear camera made by Sony, quad-core Snapdragon 801 processor, 3GB of RAM, and a 3,100 mAh battery. I'll actually care whenever they get rid of the stupid invite system. As OnePlus has been all gimmicks and games so far, I have pretty much lost interest as well. A real phone company would take orders for their phones. Are you kidding, word of mouth is the best advertising; which they were doing at first but are now screwing themselves with the invite system. I'll actually care when they start making phones for real. When a company makes only 150 phones/month, it shows they are just a scam. Hey one plus!!!!! People are annoyed with your BS invite!!!! I'm just gonna wait for soc 805 smart phones. Millions of people and only 150 to sell (and Phone Arena has the nerve to call that "lots"). I've never seen such a botched, incompetent launch in my life! It's been a month since their official reveal, and they ostensibly have 150 phones. If they have, say, 1.2 million people who will buy the phone, it will take OnePlus a total of 666 years to build phones for these 1.2 million customers at the rate they are going now. Unless OnePlus starts making phones for real, it means they are really just a data gathering scam company, not a phone company. It would be hilarious if this device actually doesn't exist and this whole invite crap is there for nothing. It looks like that, doesn't it? They've got a database of millions of people all over the world who want a phone. They can sell that for more money than they can make on their "selling at cost" phone, so why even make the phones now? I was excited about this phone, but due to this stupid "invite" system, I have lost all interest. I signed up to recieve the invite, I did recieve it via email. Then I click on the link and they want me to "spread the word" via FB, Twitter, and other social networking sites and I only had 24 hours to spread the word as much as I could. Only then are you put in a "raffle" to be picked to see who spread the word the much! REALLY????? LMAO! What is this? Only 150? LOL. What a bunch of crap. Probably for the 1st production run (I hope). Im sure any future invites will be a lot more open. Then they'll probably just do away with that system once they get production up to snuff. I think a queued preorder system would be more efficient though. Hijinks aside, still will grab one when it materializes. I lost interest too..I don't want to beg a stupid invitation to buy a phone. I wouldn't be surprised if everyone at Oppo probably cheered when Peter Lau left to do his OnePlus project. What a jerk this guy is turning out to be. I don't usually say things like this, but I hope they go under. This stupid invite system is making my interest go away quickly. I was initially interested in this phone, but now I want to look at other phones. "10 units allotted per district." Let the hunger marketing gimmick games begin! FTFY. For real, man. This invite thing and making people playing games is [s]hit. Just sell it already! they don't have foxxcon or samsungs mass production capacity ! they made a great phone and their hands are tight right now! they are like a mini restaurant with a great chef ! many people want to taste their food but they do not have enough tables for everyone ! But their main intention is not to sell but to get reckognized. Potential buyers don't deserve these hullabaloo crap treatment. You get an invite but at what cost? This is the stingiest marketing gimmick so far this year.